Understanding how to read your merchant account statement can be kind of like attempting to fly a commercial jet airliner when you’ve never even set foot in a plane. It can become very confusing very quickly and if you’re not clear on why you are attempting to understand it you’ll likely become frustrated for no reason and your efforts will become wasted. There are hundreds of interchange rates & costs, countless statement formats and multiple types of billing structures that all play into the confusion of reading a credit card processing statement. I completely promote the idea of understanding your statements but I suggest that you learn only the necessary details so that you can use the knowledge to your advantage without spending countless hours learning a task that can be simplified if you know how to. In the end, you want to know where your money is going and what you are paying for so keep focus on that concept as we move through the process of reading a merchant account statement. Your goal of learning how to decipher a merchant account statement should be rooted with the intention to maximize your own efforts to manage a needed service with the daunting task of details that seem like they are intended to confuse you. Ask yourself questions that cut right to the important aspects of the task at hand. What will I gain from knowing how to read my statements? How will I be able to use this information to maintain or better my current situation? Do I want to know how to read it because it just seems like something I should be paying attention to? Grasping the behind the scenes workings of interchange pricing is not something that you NEED to know in order to effectively manage your monthly statements. Let’s just accept that interchange (Visa and Mastercard Fees) are what they are and move on from there. However, if you would like a basic overview of interchange pricing you can click here. If you know what numbers to look for and pay attention to what numbers pop up each month in the various sections of the merchant account statement, there is no real reason to understand where they came from. Similarly, I don’t need to know how my car moves when I step on the gas pedal, I just need to know how to drive it once it’s moving. Not all statements look the same so in a flooded industry where merchant account providers are lining up for your business your statement could look VERY different than a statement from a different provider. Additionally, if your merchant account provider doesn’t provide you with tutorials on how to read your monthly statements, finding an example online can be a confusing task. Most of us favor information that is presented in a clean, logical and easy to understand format. Since it’s rarely the case that you understand a merchant statement at first glance you must learn how to effectively manage it each month in order to keep a grasp on costs. The easy way to do this is to pay attention to your effective rate and leave all of the other details for the over analytical. With that, let’s get into more detail. There are 4 sections you should pay attention to. This rule of thumb, of course, will vary from provider to provider but in general most statements should contain these sections. These four sections are primarily for interchange plus and tier-based pricing statements. 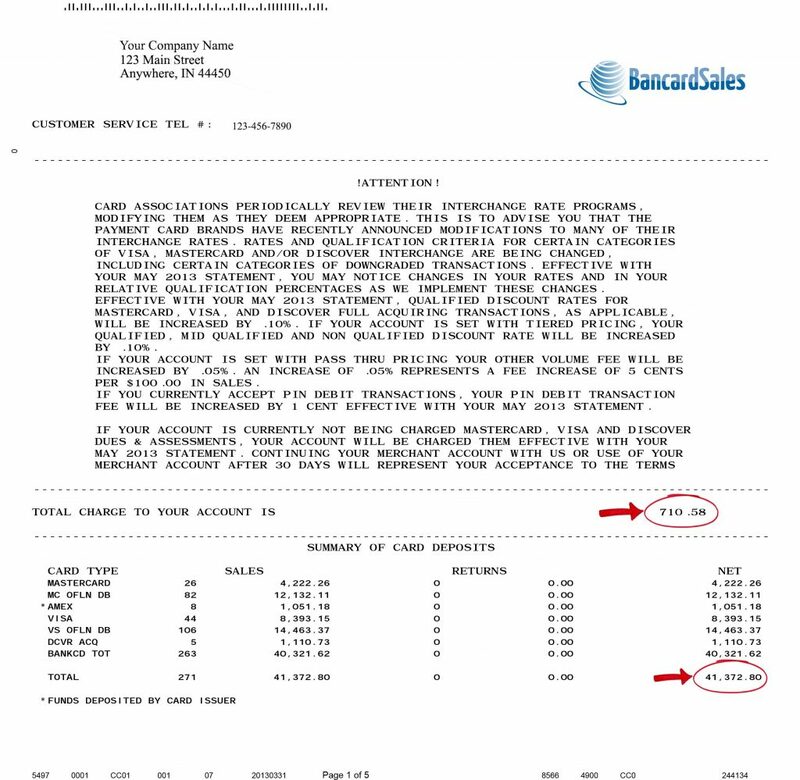 The images below illustrate how these sections show up on a monthly merchant account statement. #1 Messages or Account Alerts– This part of the statement is usually found on the first page. Here you will find reminders of important changes that are happening with your account. Things such as rate adjustments, PCI compliance reminders and online statement access instructions are among a few that could show up in this section. 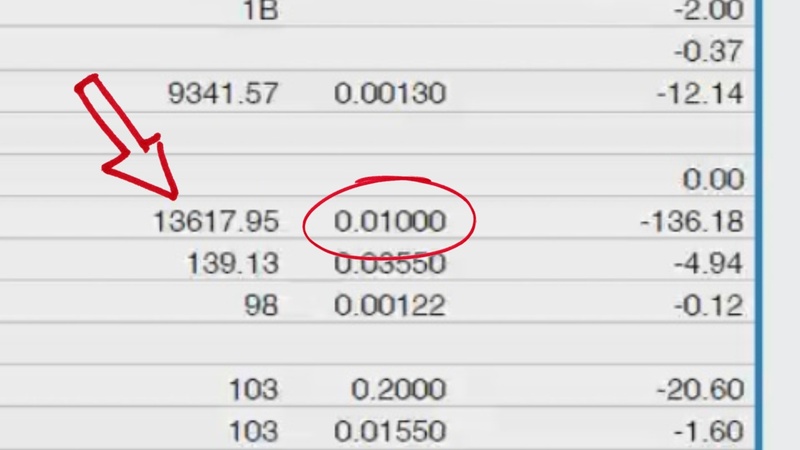 #2 Total Charge To Your Account – This part is also usually listed on the front page somewhere. This simply gives you the total fee charged for the month. This is a very important number in calculating your effective rate. #3 Summary of Card Deposits – Here you will find the total card volume your business processed in a months’ time. You should find it to be broken down by card type (Visa, Mastercard, Discover, AMEX) as well as totaled at the bottom for you. This is the 2nd very important and crucial piece of data you need in order to calculate effective rate. #4 Summary of Misc Fees – Most merchant account providers have fixed monthly fees for statement costs and/or PCI compliance fees and this is where it will show up. Additionally, you will find things such as “customer service fee” or “statement fee” in this section. All four of these sections highlight the pricing details that make up your month end charges for which you should review each month. There are four main types of merchant account pricing structures that will be displayed on your monthly statement. By far and away the two most common types of statements are the first two: tier based and interchange plus pricing. We would be here all day learning how to analyze all four different statement types so just know that, once again, at the end of the day, you pay ONE fee for accepting a TOTAL dollar amount in credit card volume. Calculating your effective rate is the same for pricing structure 1 through 3 as listed above. If you have ERR billback pricing calculating effective rate and understanding your statement is a lot more difficult. ERR billback is the most confusing type of statement to read. You have to be an expert with a trained eye in order to identify this pricing structure simply from looking at the statement. It is a very (intentionally) tricky billing statement format. Furthermore, the surcharge fees (provider markup) are hidden and not listed on the statement so there is no way of knowing the exact surcharge unless you have access to the merchant account provider’s software. Assuming that it is very difficult to get this information from a provider that is billing with this pricing structure it becomes a virtually impossible statement to read. If you have this pricing structure you can forget about attempting to calculate your effective rate. So, if you are using a merchant account provider that uses this billing system, I advise you to request a different structure in order to simply things for yourself. Checking your statements each month should be a 10 minute task. Allot yourself enough time to scan the 4 sections of your monthly merchant account statement as mentioned above and after that move on. Monitor the changes from month to month and pay less attention to the details of specific rates, fees, or miscellaneous fees that you see charged on the statement. If you have an understanding of the cost changes from month to month that is really the only thing you need to pay attention to. For example: If your business transactions and volume usually yields an effective rate of 2.65% per month and your rates remain at 2.65% (plus or minus .15%) month in and month out, you’re doing just fine. If it jumps from 2.65% to 3.00% one month you might want to contact your provider and question the reason it changed. There are account providers out there who give you transparent pricing and a straightforward explanation on how the fees are charged so all you need to do is simply align yourself with one of them. In the end, your monthly statement should give you the necessary information to calculate your effective rate and thus overall cost of processing credit cards. 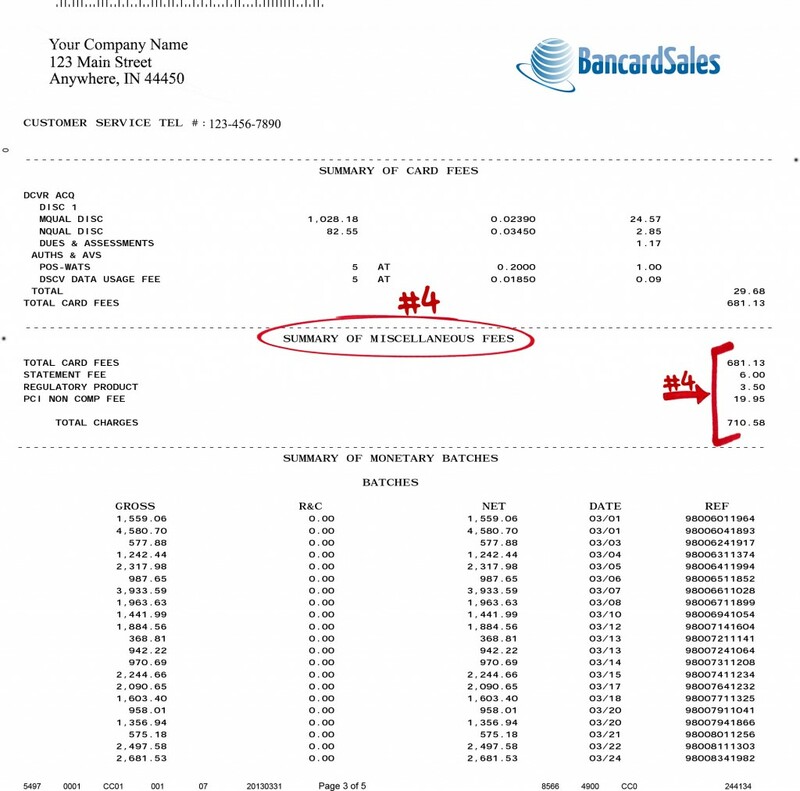 That’s what you should pay the most attention to when learning to read a merchant account statement.